The Waverly Drive file shot from August gets rolled out again as a city committee takes up the speed zone issue. The traffic panel will meet at 10 a.m. Monday, Dec. 3, in the Periwinkle Room at City Hall. The Waverly issue is on the agenda. But transportation systems analyst Ron Irish says not to expect any deliberations then. 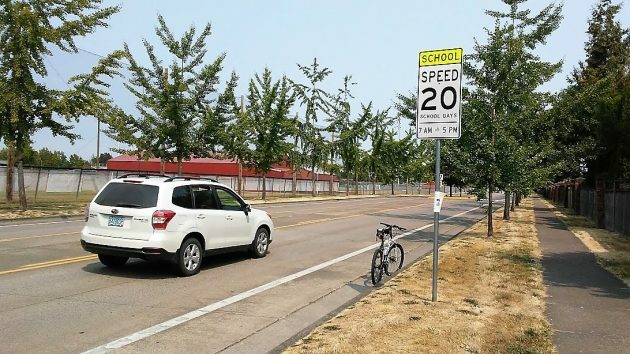 Separately, two residents of south Albany have asked the city council to abolish the 20 mph speed zone on Waverly next to the football field of South Albany High School. The council took no action on the first request this August. After the second, on Nov. 5, Mayor Sharon Konopa suggested that this was a topic for the traffic safety panel. The request in November came from Johnny Scot Van Ras, a retired paper mill worker, who got a $165 ticket for going 39 mph during school hours on Oct. 11. He is challenging the ticket in city court, and a trial date has been set for 11:15 a.m. on Jan. 28. The normal speed limit on that section of Waverly is 40 mph. The critics say the 20 mph school zone is unnecessary because of the characteristics of the street — straight, good visibility, fenced off from the school property, with designated and signalized crossings, and little use by people on foot. Also, the lower speed applies on school days, which is common next to school property in Oregon, but with frequent days off in Oregon schools, drivers don’t necessarily know what’s a school day and what’s not. This story has been edited to make clear that no recommendation on the speed zone is likely to come out of Monday’s meeting. Don’t question, certainly don’t challenge, just comply with whatever behavior local government dictates. For some there’s no place like the warm confines of the herd. Government loves conformists. It’s sad, when you think about it for more than a second. Sorry, but what this comment, along with several others, proves one thing for certain. The writer claims to be some sort of lone wolf, a political outrider who claims the high moral ground thanks to his certainty. Yet, the writer is a silly, inconsequential member of whatever tribe his beliefs fall in line with. The very sheepish behavior the writer claims to abhor is precisely the herd behavior displayed by those of the writer’s persuasion. Two sides of the same coin. No, it is far better to damn the speed limit signs. Let the mob do as it wishes. As was demonstrated in the last election, Albany residents are more than willing to vote against their own interests. It should come then, as no surprise, that anyone who might be tempted to live in a sane society would avoid any locale where the writer’s purview predominates. Sheep find it difficult to exist amongst wolf-wannabes. Pretty strong reaction to the comment. The real world isn’t binary (B/W), but gray. A dose of non-conformity can help the herd adapt to change in external forces. The herd has developed boundaries and rules which promote its health. Anti-conformity is not healthy for the herd (aka society), so the miscreant will likely be isolated and possibly ejected unless he/she reforms. Just what the heck do the above (4 of 5) comments have to do with H.H. musiings?? I thought it was about a school speed zone. Goes to prove some peoples trains do run off the tracks & continue to operate. The road ought to be brought down to 35 MPH then removing the school zone would make sense. How about instead of pointing fingers or just complaining we offer help or a reasonable solution? Here’s one, how about changing all school zone sighs to say “When Children are Present” like the ones near Oak Elementary? Currently the City of Albany has School Zones posted as just school zones, with specific times or when children are present or on school days. How about some consistency?